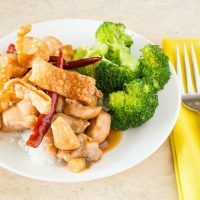 Sauteed General’s chicken is a Chinese favorite, but we don’t always want heavy deep-fried food when we want Asian flavors for dinner. I also do NOT enjoy the task of cleaning up after deep-frying. Don’t get me wrong, I’ll do it, some things like fried mushrooms, fried chicken, and egg rolls are worth a mess. We don’t call this General Tso’s chicken at my house. Number 1, we are not exactly sure how to say it and number 2 we don’t have to. Wikipedia gives me an idea how to say it, but………. This chicken dish is kind of sweet and savory with a bit of heat at the end. You can increase the heat in this dish by allowing the dried peppers to spend more time simmering in the sauce. But be careful with the heat level you are looking for, I let this simmer for too long once and thought I had eaten lava. Before La Choy rice noodles in the can became impossible to find, those are what I would use to top any Chinese dish with a gravy type sauce. Now, I cut wonton or egg roll wrappers into short strips and deep fry them to top these types of dishes with. Try it just once, you won’t go back to the canned noodles after resorting to this substitute. I know, it defeats the purpose of not deep-frying the chicken. Any protein can be substituted too. It’s your kitchen, there is no one looking over your shoulder to judge your protein choices. Just because takeout places don’t offer this in other ways doesn’t mean you can’t cook it this way. So I created a version that is stir-fried rather than deep-fried to save on some fat and calories. Not exactly sure why since I’m sure every time we have eaten even the stir-fried version we followed up with some sort of “snackies” before going to bed. I have also made this by deep-frying chicken like I would for sweet and sour chicken and it turned out better than any restaurant we have eaten this at. Lightened up General's chicken recipe is sauteed instead of deep-fried. Clean chicken of any visible fat and gristle. Cut into half inch cubes. Place in a bowl and add 1 tablespoon of soy sauce. Mix to combine. Place in refrigerator for 15 minutes. Heat 2 tablespoons of vegetable oil in skillet over medium high heat. When oil is hot add chicken and quickly stir fry it until no pink is visible. Place all contents of skillet in a bowl. Heat 2 tablespoons of oil in the same skillet over medium heat. Add 6 tablespoons of sliced green onion to skillet. Stir until slightly wilted. Add garlic paste and ginger paste. Reduce heat to low. 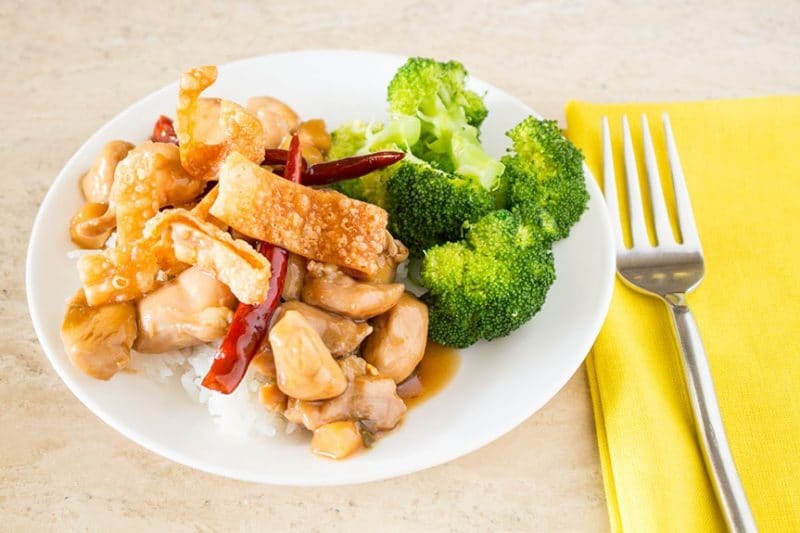 Add orange peel, water chestnuts, sugar, chicken bouillon granules, rice vinegar, remaining soy sauce, sesame oil, peanut oil, and any accumulated liquid in the bowl containing cooked chicken into skillet. Heat boiling, then reduce heat to simmer. Simmer until no sugar grains remain, about 2 minutes. Sauce can be turned down to low at this point and kept warm until ready to finish dinner. When ready to complete the dish, bring sauce back to a simmer and add dried red peppers and simmer for 1 minute, longer if you want a spicier dish, the longer the peppers simmer the more heat they give off. Add chicken and heat through. Combine cornstarch and water in a bowl or small cup. Bring mixture to a boil, add corn starch mixture and stir until thickened. Chicken thighs can be substituted for chicken breasts. A combination of chicken breasts and thighs can also be used. Goodbye, takeout addiction. This looks so simple and so delicious… and my kids are going to love me for it! Yum!